BROADVIEW HEIGHTS, Ohio, April 9, 2018 /PRNewswire-USNewswire/ -- In honor of the life and military service of her son Brian, Diane Brannigan is hosting her 2nd annual yoga benefit supporting Wounded Warrior Project® (WWP). Brian achieved the rank of Captain in the United States Marine Corps, serving one tour in Afghanistan in 2012 as a combat engineer. After Brian's passing, Diane looked for a way to raise awareness for post-traumatic stress disorder (PTSD) and the positive impact yoga can have on the lives of wounded veterans. "Brian loved yoga, and it was one of the methods he used to help with his PTSD," Diane said. "It helped him become more peaceful. I noticed Brian would sleep better; he was calmer and more relaxed. I thought to myself that yoga is such a blessing, both mentally and physically." Last year, Diane hosted a memorial yoga event both for Brian and those who struggle with PTSD, bringing together the community to participate in what he loved. 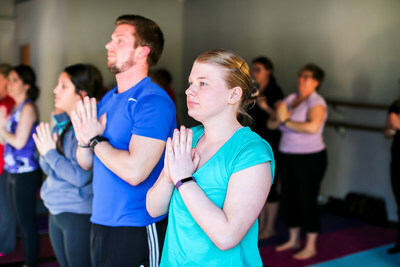 Like last year's event, participants will get to experience the benefits of yoga during a full class, as well as enjoy snacks and a raffle for prizes. "Wounded Warrior Project helps thousands of veterans, family members, and caregivers every year," Diane said. "War is ugly! That's why Wounded Warrior Project tries to help veterans bridge the gap between thriving and just holding it together. They teach warriors to face their issues head-on with the right tools and support they need to take the initiative. PTSD is different for everyone – and so the needed treatment is different for everyone." To RSVP for this event, reach out to Diane at brannigandiane@gmail.com. To learn and see more about how WWP's programs and services connect, serve, and empower wounded warriors, visit our multimedia page.